SEABLOGGERY: Is Seabury a Montessori Program? Is Seabury a Montessori Program? 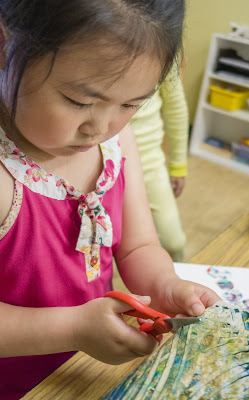 Parents who visit our early learning program often ask us whether our program is a Montessori program. Like Montessori classrooms, they see students engaged in a variety of tasks and making choices about the activities they are participating in. They see an emphasis on learning with the whole body through hands-on activities and sensory experiences. They see developmentally appropriate materials and a focus on students learning skills of independence. But Seabury's early learning program is not a Montessori program. Montessori schools are developed around the philosophy and practice of Dr. Maria Montessori, a physician and education innovator who lived in Italy in the late 19th and early 20th century. Seabury's early learning program is a program developed specifically for gifted learners – students who have unique characteristics and who benefit from practices designed to meet their intellectual, social and emotional needs. Gifted students learn quickly in their areas of giftedness, and young gifted students can often be identified by having moved through many of their developmental milestones early (talking, walking, etc.). Their large vocabulary, intellectual curiosity, incessant need to know why – and to crave concrete, complex accurate answers to their million questions often makes them appear older than they are. But they are still young and have the developmental and social needs that all young students have – the need to learn with their whole bodies, the need to move frequently, the need to learn to share and be independent and take turns. Seabury's program combines what research has told us about how gifted children learn with the best of experiential learning programs for young children to provide a program that is intellectually stimulating, creatively engaging, and developmentally appropriate. Like in a Montessori classroom, students learn at their own pace using a wide range of hands-on materials and activities. Like in Waldorf programs, students have opportunities for creative expression through art and play and movement. Like in Reggio Emilia, we emphasize open-ended questions and student-led exploration. All of this, fused with a deep understanding of the way gifted children learn, create Seabury’s program, which is specifically designed to meet the needs of gifted kids beginning in the early learning years.